Even in today’s high-tech world, your smartphone will only get you so far. 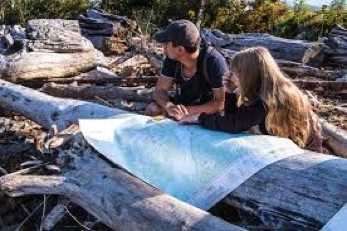 Learn how to never get lost with Envision Outdoor's wilderness navigation course. In this full-day course, you’ll learn how to use a map and compass, how to plan a route and how to confidently travel into the wilderness knowing you have the tools to get back home safely. People can get lost anywhere, which is why navigation skills are critical whether you’re on or off trail. - Why hikers get lost and how to avoid the pitfalls. - Map features, symbols and handling. - Topography and understanding contour lines, latitude/longitude and UTM. - Discussion of the compass, how to use it and its history. - Taking bearings, triangulation and understanding declination. - Route planning, calculating distance and travel times. 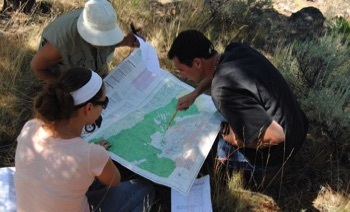 - Group dynamics, identifying landmarks and special terrain challenges. - How to stay found, identify trail signs and how to use natural features as guides. - How to navigate around obstacles and from landmark-to-landmark. - How to deal with adverse conditions (low visability, winter and desert conditions). - Tips & tricks on how to navigate manually with only nature as your guide. - What to do if you're lost, how to get un-lost, backtracking and signalling for help. *Printed venue maps & compasses are provided for this course, but participants are welcome to bring their own gear to use, upon approval of course leader. This course runs as a public, group outing, but may also be taught as a private program for you, your family, or a group of friends, with custom dates and length appropriate to your needs. Call us with any questions at 314-303-1254 or email via our CONTACT page.